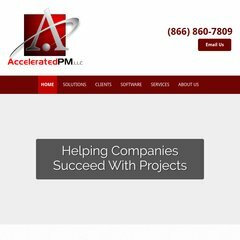 Topics: Accelerated Pm, Llc, Professional Services, Enterprise Implementations, Earned Value Implementations, and Enterprise System Integration. It is hosted by Theplanet.com Internet Services Inc (Texas, Houston,) using Apache web server. It has 2 DNS records, ns80.worldnic.com, and ns79.worldnic.com. The programming language environment is PHP/5.2.17. PING www. (174.120.243.125) 56(84) bytes of data. A ping speed test response, is timed at 32.9 ms.